Platinum has a high melting point and is chemically stable, which prevents it from easily reacting with other materials. 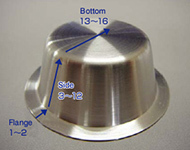 For these reasons, there is a high demand for platinum in laboratory instruments (crucibles, bead dishes, evaporating dishes, boats, etc.) Because acids and alkalis are used and instruments are subject to high temperatures in chemical experiments, platinum with its high durability is an optimal material. 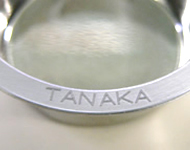 The laboratory instruments manufactured and sold by Tanaka Precious Metals are processed with higher precision than that applied to conventional models, and our products meet a variety of needs, such as marking curved surfaces with a laser marker. *The above graph plots the mean values of measurements along 8 lines obtained by dividing the product into 45° segments. 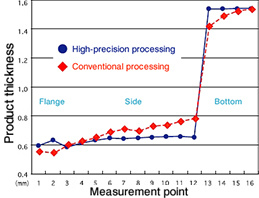 By adding oxides, not only platinum but also other precious metal materials develop higher creep rupture strength and tensile strength at high temperatures than conventional materials, which extends their service life. Since these materials maintain a strength equivalent to or higher than that of conventional materials at smaller thickness, the amount of precious metals used is reduced, resulting in cost reductions. 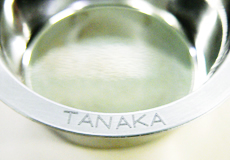 At Tanaka Precious Metals, we use oxidized zirconium (ZrO2）by taking into consideration the reaction with glass. We can also produce laboratory instruments by using precious metals materials besides pure platinum and suggest an optimal specification for each laboratory instrument suited to its purpose.